Lionheart Tax and Accounting is Victoria's largest locally owned Tax & Accounting Company. They offer a full range of personal, business, and consulting services designed to make your financial life easier. 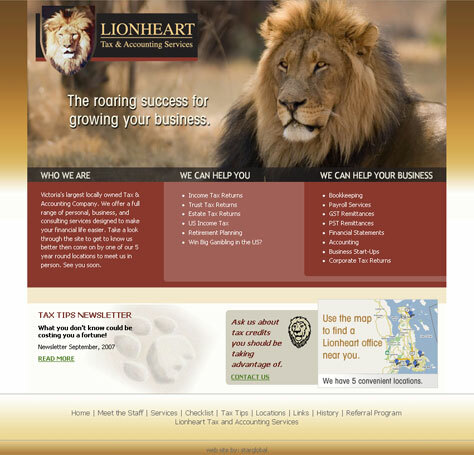 Lionheart came to Star Global with an outdated web site, and needed a fresh start. Star Global created a new look while keeping elements of the existing marketing materials. Star Global also installed a simple content management system so they could maintain textual updates in-house, and created an e-mail newsletter that allowed them to keep their clients informed about the latest tax tips, without having to print a newsletter and pay for postage each month.